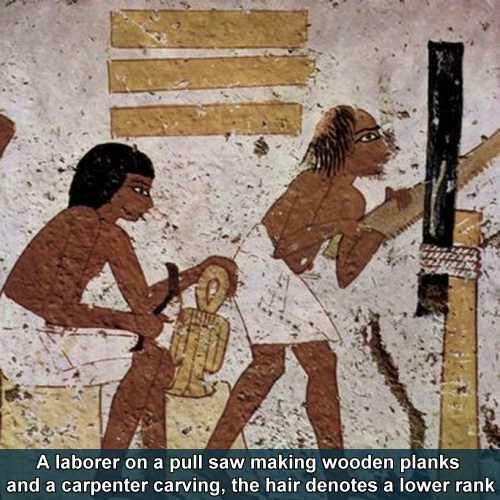 The Egyptian civilization develop many of the methods and tools that make carpenters the craftsmen we would recognize today. Climatic change about 7,000 years ago turned most of Egypt to desert except for along the Nile where farming began similar to the Sumerians (3150 BC) and developed over the next three millennia (pyramids 2500 BC) basically to the death of Alexander the Great (332 BC). The tools they used were mostly copper but worked to be as hard as a soft modern steel. Many of the designs such as the adze were used for centuries. The saws were draw only but did use off set teeth and allowed them to make the first planks, plywood and Veneer as thin as 1/32 of an inch. Basic hammers, mallets, chisels, bow drills and an up right lathe allowed the carpenters to make quite ornate pieces. The carpenters were not ‘free’ in the modern sense but they were mostly trained and skilled laborers being well respected in their communities. Some worked in "sections" on large projects or in specialized workshops. Most would have had a home that have now become more comfortable and deverse in their architectural design. 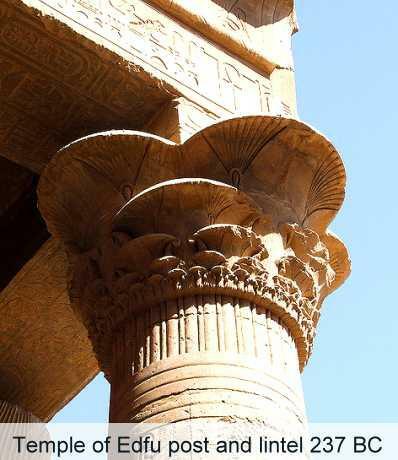 Although the use of the arch was developed during the fourth dynasty (2613 BC), all monumental buildings are post and lintel construction with flat roofs of stone blocks supported by the external walls and closely spaced columns. Around 3000 B.C. with copper the carpenters started to use wooden planks made by pull sawing down some stock that would have been lashed in an up-right position. As early as the Third Dynasty (2686 BC) coffins were made with plywood using six thin pieces of cypress and veneers as thin as 1/32 of an inch. Although there were several useful native woods most would have been imported, like cypress and cedar form Lebanon and ebony from Somalia for furniture for the wealthy. Mathematics based on a system of counting by tens had no zeros, but a surviving work the "Rhind Mathematical Papyrus", copied by the scribe Ahmes (circa 1650 BC) was quite advanced. It described the Egyptian methods of adding - substracting - multiplying and dividing with whole numbers and fractions, the solution of linear equations and the mesuration of simple areas and volumes. Even using an approximate of PI to solve an area of a circle. The Egyptians never explored the theoretical side of mathematics in the same way as the Greeks, but they knew the basic principles. Capenters in ancient Egypt were usually trained and skilled laborers, well-respected in the community and had a comfortable lifestyle. Most worked 8 hrs per day, 8 days out of 10 in workshops or craftsman sections and some were permanent employees of the pharaoh. A carpenter's most important work would have been tomb items but also doors, window fretwork, chests, boxes, cabinets for storage, beds, small tables, and chairs some quite ornate with ivory inlays and carvings. 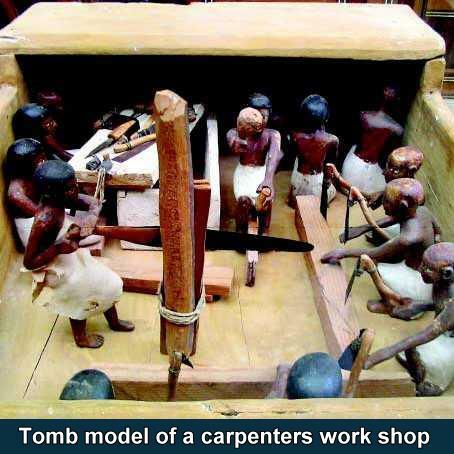 The master carpenter at this time would have worked for the Pharaoh and ran a section of carpenters, apprentices and slaves with a name like the "Drunkards of Menkaure". The idea being that the pharaoh was a god and held together the very order of the world so you worked for the good of everyone. 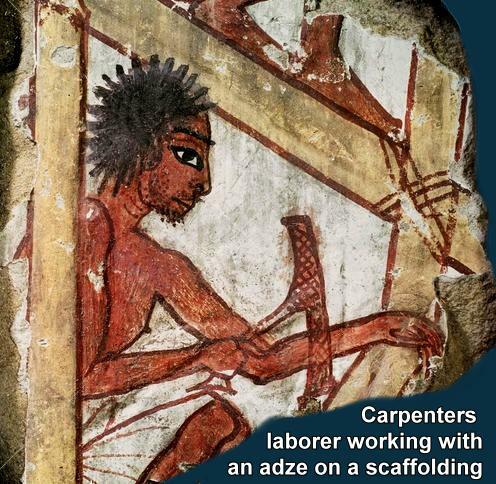 Carpenters were not "free" in the modern sense of the word, but rather were in various ways bound to and dependent upon the king and other divine powers. 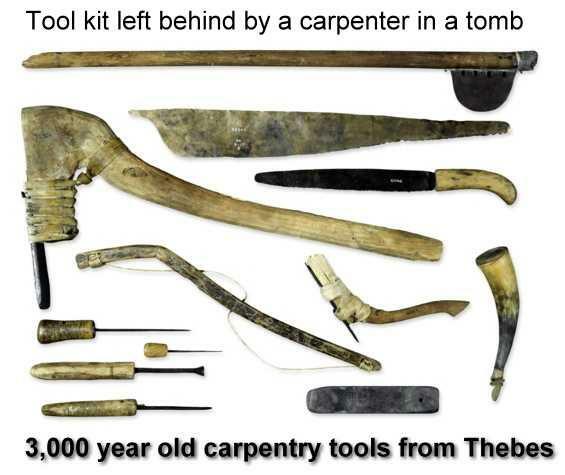 An example of this system would have been similar to the tomb-builders of Deir el-Medina where an official scribe worked with the master carpenter registering what was given to each man and oversaw the distribution of tools and materials from the royal stores. An interesting note about Ptah the Egyptian god of carpenters. He was so popular in Egypt that it is said that the name "Egypt" itself derives from a Greek spelling of the name of a temple in Memphis; "Hwt-kA-ptH", which means "the temple of the Ka of Ptah". 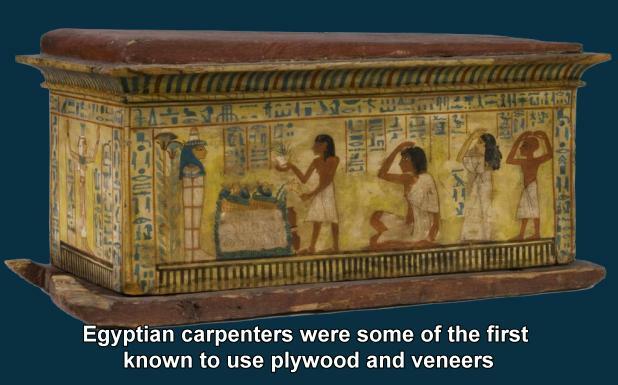 So you could say Egypt was named after carpenters. Most tools would have typically been made of copper the most often refined metal. Arsenic, a hardening alloy, is natural in some of Egypt's ore so produced poisonous clouds which is why it was later replaced it with tin to make bronze. The tools were generally cast which is difficult because of the formation of bubbles and shrinking when it cooled down then hammered cold to give them their final form. Hammering also increased the metal's hardness comparable to that of very soft modern steel. A water plumbing system from the Pyramid of Cheops (2540 BC) was recovered and the copper tubing was still in serviceable condition. Homes are still the adobe style but now you have two and three stories and quite diverse. Average homes in the cities would have been two story with storage cellars most with a roof top terrace to cool off and sleep in the evenings. Small windows were placed high in the walls to help keep out the sun and they spread wet mats on the floors to help cool the air inside. Modest furniture such as stools, chairs, beds, and chests. Rich Egyptians had country estates with as many as 70 rooms including orchards, pools, and large gardens.